Not to be confused with double play or doubleheader (baseball). In baseball, a double is the act of a batter striking the pitched ball and safely reaching second base without being called out by the umpire, without the benefit of a fielder's misplay (see error) or another runner being put out on a fielder's choice. A double is a type of hit (the others being the single, triple and home run) and is sometimes called a "two-bagger" or "two-base hit". For statistical and scorekeeping purposes it is denoted by 2B. Typically, a double is a well-hit ball into the outfield that either finds the "gap" between the center fielder and one of the corner outfielders, bounces off the outfield wall and down into the field of play, or is hit up one of the two foul lines. To hit many doubles, one must have decent hitting skill and power; it also helps to run well enough to beat an outfield throw. Doubles typically drive in runs from third base, second base, and even from first base at times. When total bases and slugging percentages are calculated, the number two is used for the calculation. A two-base hit awarded by an umpire when a batted ball is hit fairly and bounces out of play is referred to as a ground rule double. The batter is awarded second base and any runners advance two bases from the base they occupied at the time of the pitch. Prior to 1931, such hits were considered home runs. A two-base hit awarded because the batter hit into a special situation defined in the ground rules is also defined as a ground rule double. An example of this occurs where the rules of Chicago's Wrigley Field award a ground rule double if a batted ball is lost in the vines on the outfield bleacher wall. The rules of the Hubert H. Humphrey Metrodome in Minneapolis awarded a ground rule double if the ball became stuck in its Teflon ceiling. This happened only once in major league baseball—Dave Kingman hit a ball into the ceiling during a 1984 game. Renowned doubles hitters occasionally acquire a nickname that relates to their doubles hitting, for example "Mitchy Two Bags" (Mitch Moreland) and "Tony Two Bags" (Anthony Rendon). Derek Jeter has the most career doubles (32) in postseason history. Only five players in major league history have reached 50 or more doubles in a season at least three times: Tris Speaker (1912, 1920–21, 1923, 1926), Paul Waner (1928, 1932, 1936), Stan Musial (1944, 1946, 1953), Brian Roberts (2004, 2008–09) and Albert Pujols (2003–04, 2012). Three players have hit eight doubles in a single postseason: Albert Pujols and David Freese (both 2011) and Ben Zobrist (2015). The most doubles hit by a player in a major league game is four. This has been achieved more than 40 times, most recently on August 26, 2018, by Matt Carpenter for the St. Louis Cardinals against the Colorado Rockies. Only two players—Billy Werber and Albert Belle—have achieved the feat twice. Johnny Damon and Shannon Stewart are the only players to have hit four doubles in interleague play, doing so in separate games on July 18, 2000. The St. Louis Cardinals have recorded the most doubles by a team in one game: they hit 13 doubles in a 17–13 win over the Chicago Cubs on July 12, 1931 in the second game of a doubleheader. Frank Isbell of the Chicago White Sox hit four doubles in Game 5 of the 1906 World Series, the only time this has been achieved in the postseason. Freddy Sanchez was the first player to hit three doubles in his first three World Series plate appearances, doing so in Game 1 of the 2010 World Series. Later in the game, Sanchez reached second base on a base hit that was initially scored as a double, which would have tied Isbell's World Series and postseason records; the play was later amended to a single and an error, however. The sole player to have twice hit three doubles in a postseason game is Albert Pujols, both times in the 2011 postseason. The most doubles hit in a postseason game by both teams combined is 13, by the New York Yankees and Boston Red Sox in Game 3 of the 2004 ALCS. There have been 13 postseason games that ended with a walk-off double; the most recent was hit by Carlos Correa of the Houston Astros in Game 2 of the 2017 ALCS. The 1924 and 1929 World Series were both won via a game-ending RBI double. Nine players have hit two doubles in an All-Star Game, most recently Jonathan Lucroy in the 2014 edition. Among MLB pitchers, Earl Whitehill of the Washington Senators has given up the most doubles in a game. 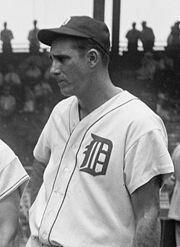 The Detroit Tigers hit 10 doubles against him on July 10, 1935. Robin Roberts holds the single-season record for doubles conceded (70 in 1953), while the career record of 820 doubles allowed belongs to Jamie Moyer. ^ "Double (2B)". MLB.com. Retrieved July 3, 2018. ^ "Anthony Rendon". Baseball Reference. Retrieved July 3, 2018. ^ McMahon, Rob, ed. (2009). USA Today Baseball Scorebook. Sterling Innovation. p. 11. ISBN 978-1-4027-6245-1. ^ "Baseball Player Nicknames". Baseball Reference. Retrieved July 27, 2018. ^ "MLB Sortable Player Stats". MLB.com. Retrieved August 7, 2017. ^ "Postseason Batting Event Finder: From 1903 to 1917, All Teams, Doubles". Baseball Reference. Retrieved June 18, 2018. ^ "All-time and Single-Season Postseason Batting Leaders". Baseball Reference. Retrieved August 27, 2018. ^ a b "Batting Game Finder: From 1908 to 2018, (requiring 2B>=4), sorted by most recent date". Baseball Reference. Retrieved June 18, 2018. ^ "Batting Game Finder: From 1908 to 2018, in Inter-league play, (requiring 2B>=4), sorted by most recent date". Baseball Reference. Retrieved June 18, 2018. ^ "Team Batting Game Finder: From 1908 to 2018, (requiring 2B>=11), sorted by greatest 2B". Baseball Reference. Retrieved June 18, 2018. ^ a b "Batting Game Finder: In the Postseason, From 1903 to 2017, (requiring 2B>=3), sorted by greatest 2B". Baseball Reference. Retrieved June 18, 2018. ^ a b Bogovich, Rich. "Freddy Sanchez". Society for American Baseball Research. Retrieved August 27, 2018. ^ "Postseason Batting Event Finder: From 1903 to 2017, All Teams, Doubles, ALCS, Game 3, at Fenway Park". Baseball Reference. Retrieved June 18, 2018. ^ "Postseason Batting Event Finder: From 1903 to 1917, All Teams, Doubles, Walk-off". Baseball Reference. Retrieved June 18, 2018. ^ "1924 World Series Game 2, Giants at Senators, October 5". Baseball Reference. Retrieved August 28, 2018. ^ "1929 World Series Game 5, Cubs at Athletics, October 14". Baseball Reference. Retrieved August 28, 2018. ^ "Batting Game Finder: In the All-Star Game, From 1933 to 2018, (requiring 2B>=2), sorted by greatest 2B". Baseball Reference. Retrieved August 28, 2018. ^ "Pitching Game Finder: From 1908 to 2018, (requiring 2B>=8), sorted by greatest 2B". Baseball Reference. Retrieved August 28, 2018. ^ "Pitching Season & Career Finder: For Single Seasons, From 1871 to 2018, (requiring 2B>=65), Stats only available back to 1908 and some partially complete., sorted by greatest Doubles". Baseball Reference. Retrieved August 28, 2018. ^ "Pitching Season & Career Finder: Spanning Multiple Seasons or entire Careers, From 1871 to 2018, (requiring 2B>=750), Stats only available back to 1908 and some partially complete., sorted by greatest Doubles". Baseball Reference. Retrieved August 28, 2018.